I become more and more a fan of Wang Bing. I’m making my way through his filmography in a random order, which is a shame, because I believe that you can actually see China’s economical development through the lens of his films. I can already see it when I watch his films in random order, and I’m sure this would be even stronger if I were to watch all of this films chronologically. Wang Bing is in a completely different league than Lav Diaz, observing reality rather than writing a story. Each director works in a different environment and uses different forms and aesthetics in order to record the dangerous, forgotten, sometimes humiliating present people are living through in their respective countries. What I begin to appreciate about the films of Wang Bing is the director’s observational style. His films are documentaries after all, and he observes (via his camera) in detail about what is happening in front of the camera, in front of his eyes. If I had to decide about which director currently shows the human condition best, it’s most certainly Wang Bing. Yesterday, I finally had a chance to watch Three Sisters (2012), which had been lying around in my shelf for the last two years. Because I moved three times in two years, all my DVDs were always in cardboard boxes and I had completely forgotten that I even had that film! So while looking for Christmas decoration, I also found this DVD again…that was a sign I had to follow! Three Sisters, as the film’s title suggests, is a documentary about three sisters, who live in Yuannan, a province in southwest China that borders on Mayanmar and Laos. They live in a village with around 80 other families but without their own parents. The eldest, Yingying is 10 years old and is forced to look after her two sisters Zhenzhen, 6 years old, and Fenfen, 4 years old. Despite her age, Yingying becomes a mother figure as a result of circumstances. Her father is absent from the beginning of the film. It is not said where he is; whether he has left the family behind, whether he is a migrant worker or even whether he is dead. The same is true for the mother, who, throughout the film, is present through her absence. The children and their grandfather talk about her, but we never actually see her. The children go about their daily lives; they dry their shoes around the fire, shoes that are broken (and which cut Zhenzhen’ ankle all the time), full of mud but still halfway usable. There is nothing else for them anyway. They have to make do with that they have, and Wang Bing shows in his documentary that those children do, like any other child probably would. 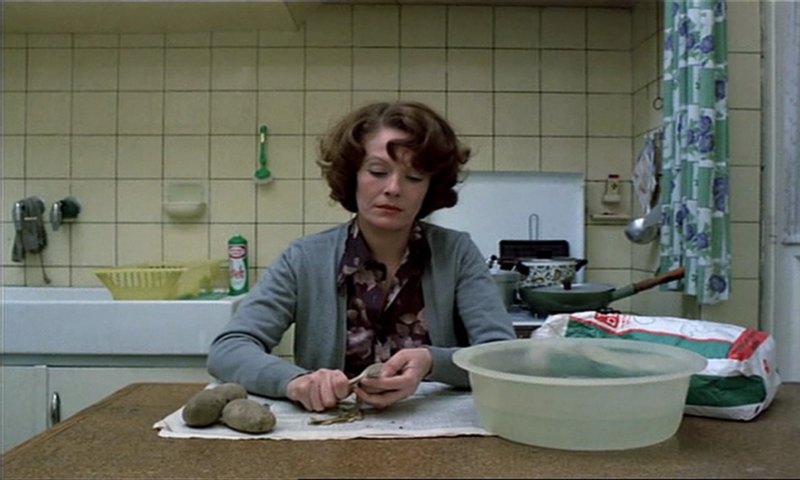 They eat steamed potatoes in their own house, slowly peeling them just like the unnamed man and his daughter do in Béla Tarr’s The Turin Horse; the potato as a staple of our food source that helps to nourish us, but also as a symbol of poverty in that there is little else left. In the evenings, Yingying and her sisters head to her uncle and aunt, who give them one proper meal a day. In return, they help with the animals, such as preparing food for the pigs. It’s those pigs that lead us to the first heart-breaking scene in the film. The sisters take the pigs out onto a beautiful pasture. It is unclear from the off who it is, but while we are seeing Yingying looking across a plain, one of her sisters shouts: “Does no one want me?” A simple image, a powerful message after having seen the three alone for about half an hour, if not more. The one who shouted this, twice in fact, could be Fenfen. I believe she was also the one who said towards the end of the film “Children who have mothers, that’s is the most wonderful thing in the world!” The lack of parental love does not often find an expression in form of words in Wang Bing’s films, but that doesn’t mean it’s not there. Those two instances alone make clear what the three sisters really go through, and it is painful. They suffer mostly in silence, which becomes more expressive in Yingying in the second half of the film. It is a small relief when the father, 32 years old, arrives. It is only then that we learn that he’s a migrant worker, trying to earn enough for the family in a nearby city. As the mother has disappeared (he says he doesn’t know where she is), he has no choice but to leave his children to their own devices. But he is a caring father. Once he’s part of the film, I felt that the film became a bit warmer, more affectionate. He had Fengfeng on his lap and laughed with his children. He washed them, which the children themselves never really did. At least Wang Bing didn’t show them doing so. He genuinely looks after them, and that was good to see after so many “cold” scenes which made my heart bleed. However, the father has also returned to complicate the family situation even more. He can no longer leave all three children to their own devices. His plan was to take Yingting to the city to have her work. But her grandfather said he should rather buy her a new pair of shoes and leave her with him. The father decides to take the two youngest to the city instead. Yingying, it is decided, lives at her grandfather’s, works with and for him, but also attends school. The father argues that taking Yingying to the city would be too expensive, he couldn’t afford the school fees for her. The only solution is to leave her behind. That decision – Wang Bing follows the father with the two little girls to the bus – has an effect on the rest of the film. Three Sisters becomes a portrait of a lonesome sister, who, all of a sudden, no longer knows what to do, why she is there, what she is there for. Even though she goes to school, something we see only once, and even though she also helps her grandfather with his animals (sheep and goats), she becomes an isolated child who seems to suffer in silence. Once her sisters have left, she turns quieter and quieter, very much detaches herself from this world and from the people around her. She does her chores, but she no longer feels present at all. I often felt as though she was a ghost; she herself, like her mother in a way, becomes a present absence. It’s a remarkable change that takes place in the film, and I’m very glad that I watched the long version of the film (there is a shorter version called Alone), because that really brings the whole power of this growing loneliness and this changing character of a little girl to the forefront. Wang Bing is superb at observing the daily lives and daily struggles of those who live on the margins of society. What I noticed once more in Three Sisters is that all of his films have a journey at its core. It’s movement, rather than stillness. In West of the Tracks, the factories are dismantled as well as all the houses that the workers had so far lived in. They need to leave and look for another home. In Ta’ang, too, there is the idea of being forced to leave one’s home at the core of the film. Bitter Money shows very young migrant workers, who leave their home to work in the city. Three Sisters has the same core theme; the father having to leave to earn money, the people in the village not being able to pay their tax will see the authorities take their cattle away, which means there won’t be much livelihood left for them. They, too, might have to leave as there is talk about destroying houses, building new ones and bringing electricity to the region. It’s a very small sequence, but it reminded me just how much Wang Bing’s films are centred around the issue of people not having a home. With that comes restlessness, concerns, questions. All of that is deeply inscribed into the faces of Wang Bing’s characters. The director might focus his camera on China, but his films tell a larger story about where the world has been going politically, economically and socially. Very nice write up. And a wonderful film as well. I loved the shots in the field following the pigs. It’s amazing how the 3 sisters manage to avoid to look into the camera, or to address Wang Bing, at this age. Maybe he discarded all the “regards caméra”. But it’s incredibly intimate, with a real proximity with these girls and remains at the same time distant like an impersonal camera. This Yingying accomplishes an unbelievable work, so mature and resilient. What was I doing when I was 10??? What is the version “Alone” about? Only focusing on Yingying alone? Or is it extra footage? Did you see “Father and sons” (Fu yu zi; 2014)? It’s only static shots of a poor cabin where a father lives with his 2 sons on only one bed. Very contemplative. Few complaints by the sons who endure this situation of extreme poverty with dignity and strengh. Thanks a lot, Benoit! I haven’t seen Alone yet. I do have a copy somewhere, so I will check it once. I’ve heard that it’s really just a shorter version. What you say regarding a possible focus on Yingying alone might actually be true. There is a lot that you can do with the footage of just her. You’re right in that the film is an intimate portrait without the children breaking the famous 4th wall. But Wang Bing is present. We can see the microphone in one shot, we can hear him breathing while climbing a mountain to reach the bus, we hear the bus driver and the girls’ father speaking about the director in front of the camera. I found that he had a ghostly presence, which I didn’t mention in the post because it became too long. I haven’t seen “Father and Sons”. Sounds great! Need to check whether I can get a copy from somewhere. Thanks so much for the recommendation! Dir Wang Bing is the most cold-viewed documentary maker and truth teller I have ever seen, other filmmakers will be included in my research and filmography are Zhao Liang and Wen Hai. I do think these movies can bridge the gap between the subdivided sub-genre of these authors-directed arthouse films, such as essay films, subjective films, slow films (you are definitely working on it) and writer’s film (in Chinese wen ren dian ying). What exactly is your research about if I may ask? It sounds interesting! Would love to hear more! I just submitted my research plan, in order to apply for a PhD study, it is mainly about the auteur theory and the Chinese mainland New Generation, Wang Bing’s works are the really discussable. The thing I’m really interesting is that how to explain the “literariness of this kind of films”, (in Chinese dian ying de wen xue xing) and how the conception, essay films, has been “localized” by mainlander filmmakers and film professionals. Their works are named as wen ren dian ying, which synthesize various characteristics of traditional documentaries and arthouse films. Well, it seems like the relationship between cinema and poetry (discussed by Pasolini ), or the conceptive agruments about the essay films, discussed by Rascaroli. However, it may be more poetized and literary. I had read your articles and watched the recommended cinemas, and I felt the same feeling about the films you like and I like. And, honestly, your research sparked my ideas. Is it clear enough for you to understand my interests? I’m wondering how to equate literature (“writer’s film” or “literariness of film”) with a documentary, which is not written in advance, but captured on the spot. Also I have a different idea of “essay films”, I think there’s need to be a narrator using “I” (first person discourse), like Chris Marker’s Letter from Siberia or Sans Soleil… Unless you think of an essay film like Jean Vigo’s A propos de Nice then it’s wordless and documentary. Really excellent film example, the audio-visual language is well designed, and Wang’s method is sophisticated and realistic. Definitely worth a read, and would love to read your thoughts on it, too. I think I have read this article a long time ago, but just reread it. It’s full of great observations. What I love in particular is the quote by Caroline Champetier at the very end, this idea of and the search for a strategic point. That gives me something to think about actually. Thanks for passing the article on!